I worked with Todd at W.T. Clothiers over Spring 2018 to have a women’s custom blazer and three-piece suit made (jacket, pants, vest). From start to finish my experience was superb. After sending my inquiry via the website, Todd swiftly returned my call to get a feel for what I was looking for, the timing I was looking to have items completed by, and the basics of pricing among different fabrics. I visited his store in Fairfax about a week later (two doors down from a great coffee shop, which was a plus) for my initial fitting and appointment. I’ll confess the fitting took longer than I’d planned – so budget extra, it’s extremely thorough– but it was more than worthwhile since I could be confident throughout the process that the end-result would fit me very well. While I had a generic idea of what I was looking for, it was also at that appointment that Todd sat with me to discuss different fabric options and colors. In terms of choices, there are simply tons. My three-piece suit ended up a dark grey (almost pewter) in a fabric that has some stretch to it; for someone moving around a lot that was a must for me. That said, there were probably roughly a dozen colors that I could have chosen from, from light grey to navy blue to bolder primary colors. 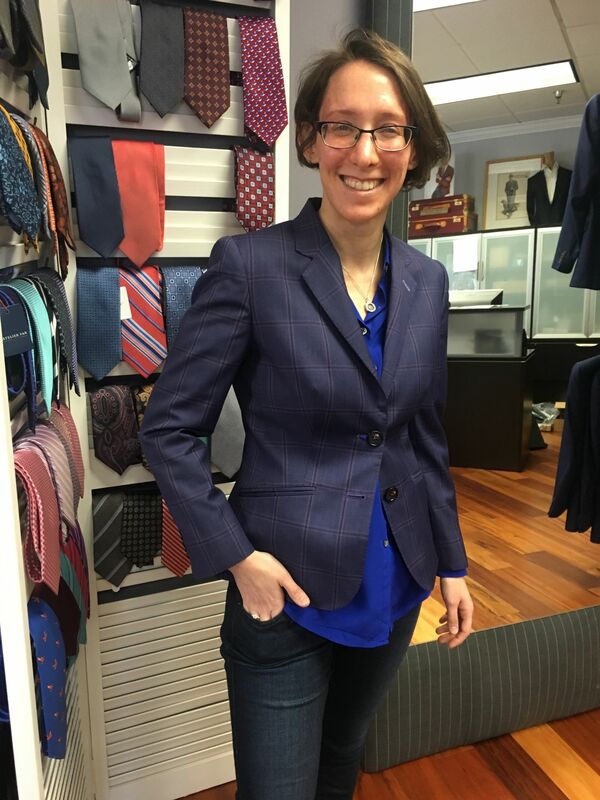 While the stretch suit fabric is a bit more limited in color options, for everything else there are literally binders full of things to choose from – suit color, inner lining, details, buttons. You name it, Todd has a wide selection for it. I opted for the more conventional suit fabrics for my blazer. I didn’t have a clear idea in mind of what I was looking for in terms of color, so I commend Todd for gauging my personality, and throwing out some wide options in discussion to get a bit more feel of my style, things out of my comfort zone that I would try, etc. In the end, the blazer I ended up with was *way* out of my original color comfort zone -- and I’m so glad. I opted for a plaid purple and really orate inner lining . The end product is simply stunning; to say I get compliments when I wear either suit is ridiculous understatement. After the initial fitting and selection, the rest was straightforward. I came back twice; once for an initial fitting when things first came in, to make the usual minor adjustments, and the second for the pick up. Todd was easy to schedule with by email, and for pick-ups it was straightforward to drop by and work with his colleague to finalize payment if he was out with another client. Again, it was a great experience from first to last. The prices are a commitment, but it’s an investment, and you’ll get something unique that you’re thrilled with out of the process. I look forward to working with Todd again.